I am a bad, disorder bad blogger. I haven’t posted a thing in two weeks! Apologies, but I was celebrating Christmas with my family by roasting a whole pig in our backyard on Christmas Eve. Then it was up to Michigan for 10 days of snow, cold weather and a whole lot of cookies and libations. It was great to see the snow and snuggle under a pile of blankets, but I was very happy to don my flip flops the second I got home. Now I’m back and I’m ready to cook up a storm! Since it’s a new year, I’m sure there’s no shortage of new resolutions to eat better. Since I don’t really do diets, this means eating healthier and hitting the gym more often. But healthier doesn’t mean diet food, and it definitely doesn’t mean boring food. For me, it means Spanish-style tuna salad. More veggies, no mayo. Start with imported Spanish tuna packed in tomato sauce. If you can’t find it at your local grocery store, opt for some sold-pack tuna in olive oil. 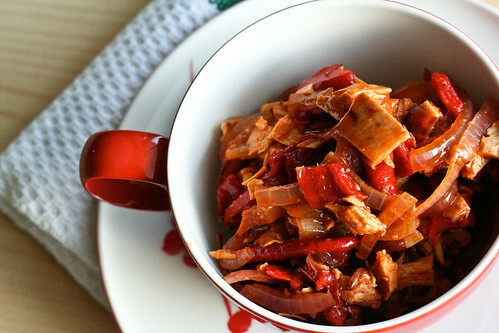 Saute some onions, add some chopped piquillo peppers (or roasted red peppers if you can’t find piquillo), sherry vinegar and a pinch of salt and you’ve got a tangy and delicious tuna salad. Eat it with whole wheat crackers, on a salad, in a sandwich, or wrapped in some whole wheat flatbread with lots of leafy greens. Either way, it’s a great alternative to the traditional tuna that will make you feel great about starting the new year right. Drain the oil from the tuna into a small saute pan and place over medium heat. Add the onions and saute until soft, about 10 minutes. While the onions cook, add the tuna to a mixing bowl and break up the pieces. Stir in the piquillo peppers, onions, sherry vinegar and salt. Mix well and enjoy!